The sorrows of the oppressed. Where lie our homesteads, our fathers' graves! Your fatherly hand is mighty and strong! We are your weary children forever. Merciful and mighty throughout the ages. Every leaf still, quietly sleeping. Only the stars are twinkling, burning. So full of longing and inspiration. Luring the heart to take its rest! Only you are calm and unchanging. Lulling the earth with dreams of sweetness! Why can't you still all of my longing? Why am I sad then, why am I yearning? O to possess this beauty eternal!.. * First published in 1895; set to music and sung as a folk song. Sixteen variants have been discovered. ** Ending of a longer poem, first published in 1902. 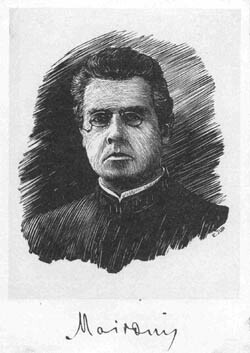 Set to music by Lithuanian composer A. Kačanauskas and sung as a hymn, it became especially popular among the Lithuanian diaspora. *** First published in 1920—written in the form of a rondo with repetitions. Set to music, it became a favorite Lithuanian song.